SUMMARY: The SAP Service Marketplace extranet, web content hosted on the service.sap.com platform, is being replaced by modern alternatives. The majority of content sections have already found a new home; others are being migrated or have become obsolete. The most important links will continue to work. The SAP Support Portal and SAP ONE Support Launchpad – including its support applications – are not affected, nor is any other SAP website. It feels like “a long time ago in a galaxy far, far away …”: In 1998, SAPNet for Customers & Partners first saw the light of day. The Internet was still in its infancy. Connection speeds were slow: Most people used dial-up access; modems reached peak download speeds of around 56kbps. And perhaps you were amongst the almost 60 percent of non-Internet users who said that they wouldn’t worry at all about missing out on something by not going online. Well, the times they are a-changin’. Twenty years later, and we all know which tremendous impact the Internet has had on our societies, our way to communicate, to consume and share information. The SAP Service Marketplace will soon be retired. There is sometimes confusion about the term “SAP Service Marketplace”. When using it, I am referring to web content hosted on the service.sap.com platform. SAP Support Portal. Yes, many years ago, it had the address service.sap.com/support. But already in 2014 it was migrated to a modern alternative, support.sap.com, and nothing is left on the SAP Service Marketplace platform. SAP Support applications, for instance the Software Download Center, the Incident Wizard to report problems with your software, the SAP Notes & KBA search. Almost all of them found a new home in the SAP ONE Support Launchpad launchpad.support.sap.com. SAP PartnerEdge, SAP Help Portal, SAP Community, … All these are websites that were never hosted on service.sap.com or, like the SAP Partner Portal, moved to a modern infrastructure far, far away from the SAP Service Marketplace. So, what will be retired? Actually … – not much! 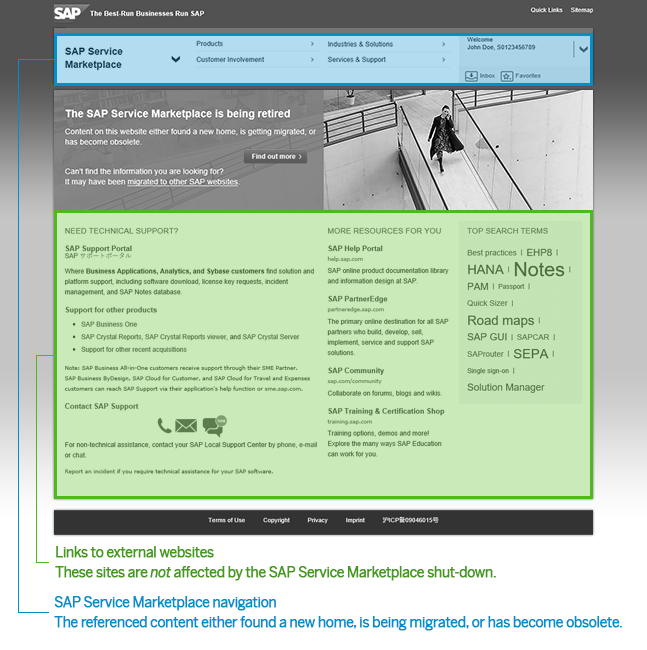 If you enter the URL service.sap.com into your web browser’s address bar, you will end up on what’s left of the SAP Service Marketplace after the huge content migrations of recent years. Apart from the many links to other websites on its homepage, it’s a portal that offers information about SAP products and services. Well, at least that’s what it used to offer. I am sure returning visitors have noticed that many of these content sections were already migrated: to SAP’s public website SAP.com, to the SAP Help Portal, which houses the entire library of SAP product documentation, to the new SAP Support Portal. What remains, for instance information about legacy products, is only a distant reminder of what the SAP Service Marketplace used to be. No one is going to miss this content once SAP Service Marketplace has been shut down. A few remaining content sections in the SAP Service Marketplace are still being migrated to other websites. Once this has been completed, the website will be an empty shell. If you somehow end up in a migrated content area, for instance by following your bookmarks, overlays will inform you about the move and route you to the new location. You can already see them in action for many, many content sections, for instance http://service.sap.com/crm. Eventually, the underlying platform will be switched off, and the address service.sap.com will no longer have a target. But don’t worry: SAP will then make sure that the most commonly used URLs will be redirected, so they continue to work. UPDATE: All content areas that can be reached through the SAP Service Marketplace navigation (under Products, Early Adoption, Industries & Solutions, Customer Involvement, or Services & Support) have been migrated to other SAP websites. The navigation will therefore be removed on June 26th, 2018. The above blog is only about the retirement of the website, not any other scenarios – especially applications – running on the service.sap.com platform. So the shutdown won’t have a direct impact on the issues you described. However, we are also working on moving the last remaining applications off that platform (see for instance https://blogs.sap.com/2018/04/26/s-user-authorizations-for-sap-support-applications-goodbye-clusters-welcome-authorization-packages/), so it’s just a matter of time before inconsistencies will be resolved. You are right, in some cases there could be two passwords for your S-user ID, see https://blogs.sap.com/2017/10/12/password-policy-for-sap-support-portal-and-sap-one-support-launchpad-about-to-change/. Using single sign-on, this can be mitigated. Luckily there are not many touchpoints with the legacy infrastructure anyway, and their number is steadily decreasing. From Basis perspective there seems to be everything available on service market place but its very hard to get to the destination… Hope these changes will make our lives better. I tired to follow the steps below to find the Oracle guide. But it redirects me to the “https://help.sap.com/viewer/index”. I tried to find the same guide in new viewer but failed. Could you please help about this? Unfortunately, I don’t know about the whereabouts of all documents that used to be hosted on service.sap.com; there are simply too many (several millions) of them. However, on the SAP Help Portal, I found assets for the product ‘Oracle’, at https://help.sap.com/viewer/p/ORACLE. You have to log on with your S-user ID to access them. This has been one my biggest issues with the new website. Shortlinks like /instguides no longer work even though a lot of documentation still points to it. If you could go through and make sure the various aliases on service.sap.com go to the right place it would make life so much easier. All URLs like service.sap.com/instguides will continue to work. Currently, while the SAP Service Marketplace is still up and running, visitors will get an overlay displayed informing them about the migration to a new home. This is to create awareness and encourage visitors to correct their bookmarks. Due to loss of performance and unnecessary logons, redirects are not the best option. Once the SAP Service Marketplace platform has been switched off, these URLs will be redirected to their new targets. Like a lot of content on SAP Service Marketplace, this section was outdated as well. The Testing Strategy Assessment service has been replaced by other services. I suggest you reach out to your account executive to discuss which modern option to use instead, for instance Testing Services for SAP Solutions or Strategic Roadmap for Application Lifecycle Management and Testing. Could you please help me with finding building block for EHP8. This topic was never covered in the old SAP Service Marketplace, hence it wasn’t migrated from there. Which means that unfortunately I am not in a position to help you find its whereabouts. Thanks for the input peter, I will check. Peter – Any advice on where/if I can still find the “old” SAP Best Practices and its content for ECC 6.0? – A customer is looking to re-purpose the BPP’s that used to come with the Best Practice content. The new Best Practice Explorer site only has content for S/4 HANA. Is there a link to access the legacy Best Practices or a CD/DVD that can be ordered? Old packages should still be available in the SAP ONE Support Launchpad’s software download area. I hope the one you are after is listed there as well. SAP Best Practices for Master Data Governance – Is not there ., Please help me. SAP Best Practices and RDS packages have been migrated to the SAP Best Practices Explorer, https://rapid.sap.com/bp/, and that’s where the redirect on service.sap.com points to. Associated download objects can be found in the launchpad’s download area as mentioned in my comment above. If content cannot be found, this indicates that it has been retired. In the case of MDG, this happened about a year ago. However, for some “exceptions”, you can still request to get them, see SAP Note 2705882. Hope this helps. I am an internal SAP employee and previously use the old market place for some technical documents reference(for example, BC400, BC401 and etc), my question is after the migration how can I access that contents? thanks. Can you give me an example (i.e. the navigation path to information that you frequently retrieve from the site)? Technical documentation is usually hosted in the SAP Help Portal, help.sap.com, not in the SAP Service Marketplace. We can also discuss via email. previously I use link https://websmp108.sap-ag.de/~form/handler?_APP=00200682500000002672&_EVENT=DISPLAY&_SCENARIO=01100035870000000122&_HIER_KEY=501100035870000012622&_HIER_KEY=601100035870000122728&_HIER_KEY=701100035871000280874& to access all training materials like BC for a technical doc, AC for functional doc and etc, but recently I would like to retrieve some other documents from this site, it told me this site is retired. However I do not have any navigation path from this site, as I just save the final URL, do you have any information regarding my use case, thanks. Let’s take this topic offline. It’s about internal information, and discussing it on this platform does not add value for others on this forum. We are missing essential information on connecting R/3 and ERP to BW. Where did service.sap.com/r3-plug-in go? The essential content of service.sap.com/r3-plug-in is now available and up-to-dated in SAP Note 2771545.